My friends and I started off the night by drinking multiple Four Lokos in my dorm room, Wait 030. Back in the day, Four Loko had alcohol and caffeine in it (something else you don’t know about), so we all got really trashed and hyped. Then we went to the Spa, where Moorebid used to be. While I was blackout, I made out with one of my friends for what was apparently two and a half hours. There were people vomiting in the Saratoga Room and ambulances running shuttle service to and from Saratoga hospital. I think all in all 17 people were treated for alcohol poisoning. When I woke up, I dry-heaved so hard that I burst blood vessels in both of my eyes and developed a rash on my swollen face which rendered it looking like a poppy seed muffin. The rash lasted three days, my eyes lasted six weeks, clearing up just in time for me to go home to my parents at Thanksgiving. They changed the venue to Williamson Sports Center; people got trampled in the hallway between the weight room and the stairs. Bust. Isolated the dance in just the Dance Gym and Big Gym and charged $10 admission. Super lame although people got almost as messed up. While writing this, I’ve realized something: If Moorebid continues to trend downward in overall intensity, you will probably all continue to think that we upperclassmen are losers who never go hard. 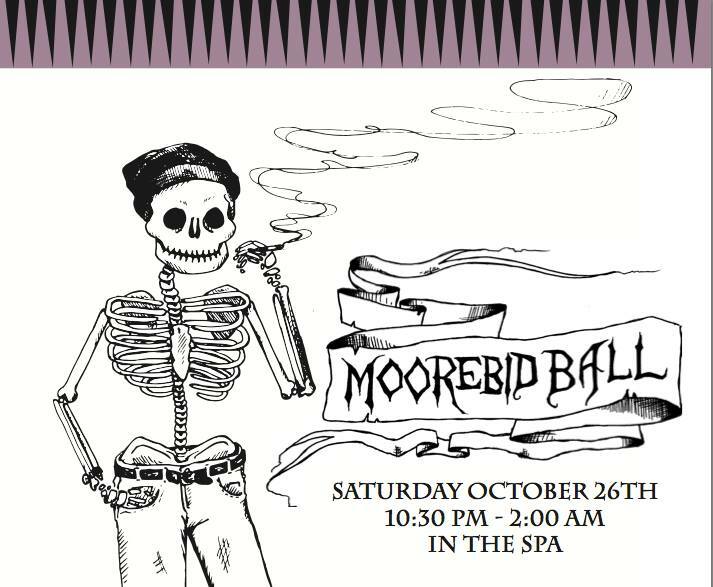 In all honesty, at this point, Moorebid, despite its history as something truly debauched and indicative of our generation’s binge drinking and rave drug use, is no more than a lame, school-sponsored dance party with an over-eager dubstep DJ and tight Campo presence. It’s rather careless too, the continued ticket policy: “selling 500 tickets in advance, which will get you in and out of the event until Midnight. After midnight, tickets will expire and students without tickets will be allowed in (for $5 door price) until we’ve reached fire capacity.” Once tickets expire, students can’t leave without paying re-entry, creating the standard for kids to get considerably drunk in the dorms beforehand and then stumble on over to Case. In turn, perpetuating the culture of binge drinking already present all over campus. In closing, I’ll say this – if they’re charging admission, I’m not going to go. There should be about six or seven sufficiently fun, well-costumed parties going on between Northwoods and off-campus, each of which will probably be a better option. There is only one thing I can say having completed this longitudinal study of Moorebid: That I’m sorry. I’m sorry we went so goddamn hard (dangerously so) that we forced Moorebid to be (student) government-regulated, but such is college… I guess.